New version of "Sharky’s Air Legends" released. Now with SOUND EFFECTS & XNA v1.0 converted!!! You asked for it. At last there are Sound Effects! Also it is all converted for XNA v1.0 that was just released yesterday. No pain at all. Done in 5 minutes. Go grab the new (& coolest) release from the Latest Builds page here. My first cut at sound, but I’m actually pretty stoked about how it’s turned out. The crazy perfectionist in me will continue to refine the sounds of course. Now remember, your comments, ideas & feedback are always welcome. 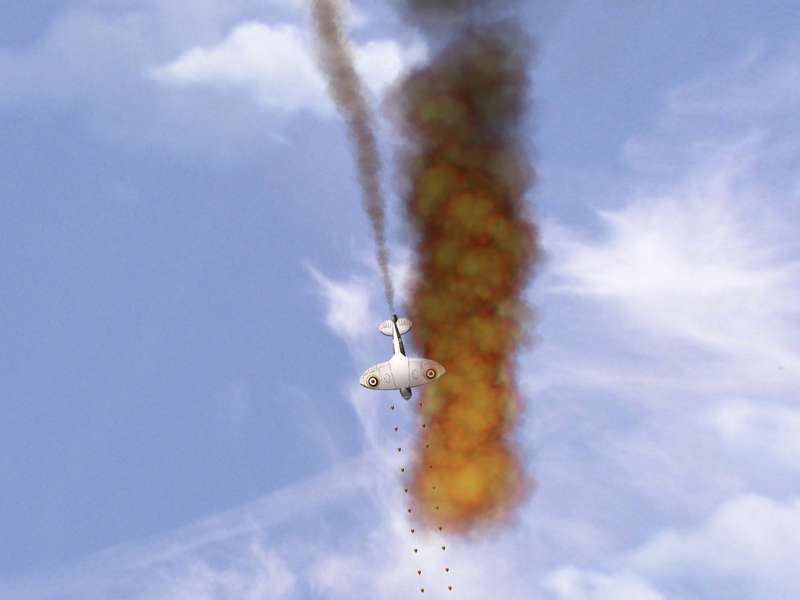 Another new release of "Sharky’s Air Legends" – improved the Explosion/Fireball visuals. With 3 altered lines of code I’ve made the Fireball & Explosion effects look a whole lot better. The difference between the two effects was really too similar. They’re more distinct now, and I’m much happier with them. Get the new release from the Latest Builds page here. New release of "Sharky’s Air Legends" – did someone say "explosions"? I’ve released another new build of the game. You can get it from the Latest Builds page. You asked for it – EXPLOSIONS, fireballs, whatever you want to call it. Skywriting feature partly complete. Use the XBOX 360 Controller’s B button. For Keyboard users use the Caps Lock key. Left Control is now Shoots. Works nicely with the Left Shift for throttle. Next "feature" juggling – Great balls of fire!! So I got bored of completing the “skywriting” (for my kids) feature mentioned earlier. Bit of a tangent really. It’s kind of there. Call me lazy - call me bad daddy, but dedicating a new game mode + menu to it just wasn’t thrilling enough for me right now. (besides, the kids somehow broke one of my 360 controllers, and my son chewed the thumbstick on the remaining working one. grrrrrrr) Also the fancy new “3D” rendered menu I was working on was a bit more difficult than I’d hoped. ”Skywriting” will still be in the next release, but remains blended with the rest of the gameplay. Just a differen’t button press to pump out the coloured smoke – if you feel so inclined. Now, what I am enjoying is adding EXPLOSION/Fireball effects!!!! That will be in the next release in some form or other. I started off doing a particle system for an explosion, and what eventuated was an awesome effect of the plane engulfed in flames. I’m extremely happy with it, so if that isn’t motivation then I don’t know what is. Might post a screenshot soonish – stay tuned folks. You are currently browsing the Sharky's Blog weblog archives for December, 2006.